Yesterday, we got the latest Ipsos poll. And for the first time during this campaign, it was showing the NDP ahead (by 1 point) among decided and leaning voters. While this poll confirmed a trend where the PC was decreasing while the NDP was rising, the actual numbers were quite different from other recent polls. A closer examination of the four most recent polls (Ekos, Abacus, Mainstreet daily tracker and Ipsos) shows that online and phone polls (Automatic phone calls, called IVR) do not agree on the current state of the race. 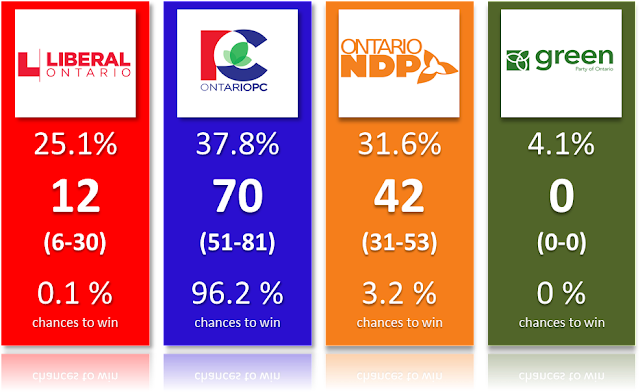 The two phone polls (Ekos and Mainstreet) show the PC well ahead (about 10 points, 39% versus 29%) while the two online polls (Abacus and Ipsos) suggest a tied race. At least everybody seems to agree that the Liberals are far behind in third, so there's that. Online and phone polls not agreeing with each other isn't new. We had a similar situation between Ekos and Ipsos 4 years ago in Ontario. Still, let's hope they both have a part of the truth and averaging them will work. Arguments can be made both ways. Some people don't trust online polls in general (note: they are wrong). An experiment by Campaign Research 4 years ago showed that online polls tend to overestimate the NDP. If this is the case again, then the NDP is most likely around 32-33%, right between the phone and online polls. Some have criticized IVR polls for failing to reach enough young voters, but whether this is a problem or not mostly depends on what the youth turnout will be. Mainstreet has also talked about the failure of IVR in the Calgary mayoral election. At the end of the day, we can't really pick one method over the other for now. The best we cna do is to be aware of the disparities and keep monitoring it. I wish we could get a live caller poll (CATI) as this is the gold standard of polls. For now, I'll simply continue to average polls. If you feel very strongly that one set of polls is incorrect, feel free to enter your numbers into the simulator. Using these four most recent polls, we get the following projections. While the Conservatives are still ahead, the chances of a majority are dropping fast. In the span of a week, we went from an almost certainty (over 90% chances) to "only" 66% chances. 66% might seem very high but it means there is 1 chance in 3 that Doug Ford doesn't get a majority. This isn't a small probability. A weak analogy would be that you wouldn't get in a car that has a 33% chance of crashing. 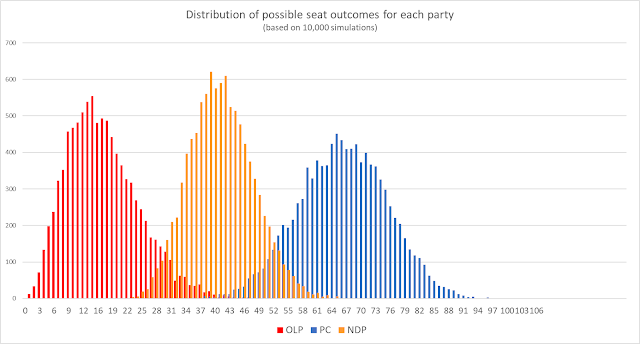 This is especially important because if Ford were to fail to secure a majority (62 seats), you could expect a complicated situation where the NDP and Liberals could try to make a deal. It'd be a messy situation to say the least. The situation isn't dire for the Tories (yet?). They are still leading (in the average and phone polls), their numbers show they do better among older voters (more likely to vote) or people who voted last time (more likely to vote again). 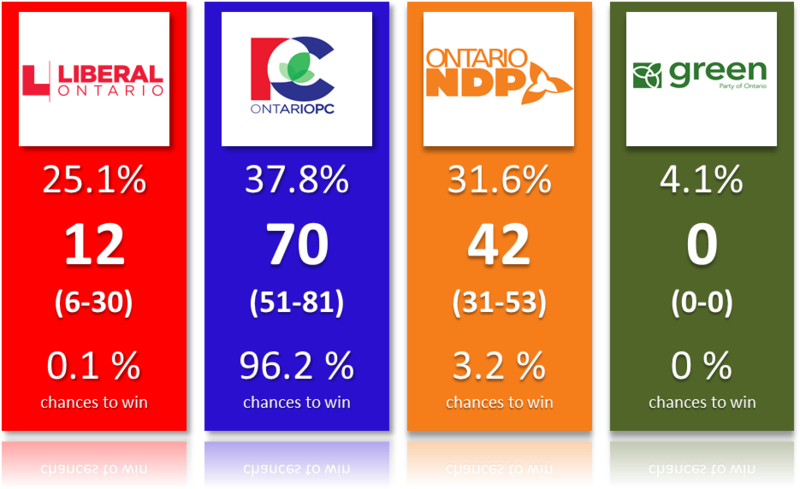 They also continue to dominate the GTA, Toronto included, with its ton of seats Add the seats in the East and Central Ontario plus a couple in the Southwest and the PC is still the favourite to finish first. Make no mistake here, the PC is favourite right now. 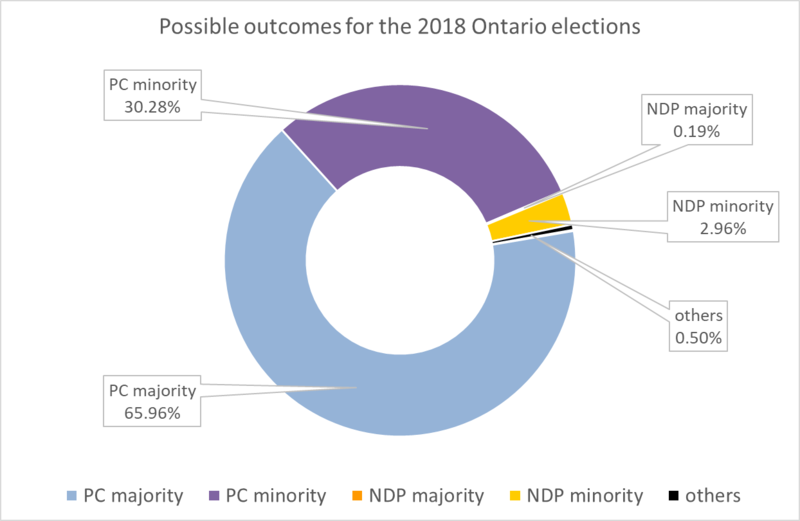 The NDP remains behind but could get some traction if we start talking more and more about their chances (some might say it could also motivate the PC base to go out and vote but I don't think it matters, these voters were already motivated). The NDP vote is also less efficient than the Tories', mostly because of the GTA. The NDP vote is also too unevenly spread. It's concentrated in the North and the Southwest (Hamilton, Niagara, etc). If you look at the regional polling averages, the standard deviation across regions is 4.9pts for the Liberals, 3 for the PC and 5.6 for the NDP. The PC is remarkably widespread and is therefore competitive in every region. This is ideal when you are the main party and you want to win the most seats. Being concentrated like the NDP is good when you are at 19%, not so much at 32%. I think I'm a little bit surprised at how resilient the Liberal vote has been. After a sharp drop at the very beginning of the campaign, it has remained quite stable. I have them slightly higher than the raw poll average however because I allocated the undecided non-proportionally (a method that has proven to work and a systematic examination of past electoral polls shows a clear underestimation of incumbents). Still, it seems the OLP has reached its floor, at least for now. For Andrea Horwath, her best shot at convincing some Liberal voters to switch side (to block Ford) is more likely during the debate next week. That's all for now. here below are the detailed projections.